The WaterRower has been designed as a natural rowing simulator and is unrivalled in replicating not only the superb physiological dynamics of rowing, but much of the aesthetic pleasure as well, giving the calming feel of a boat gliding down the river. 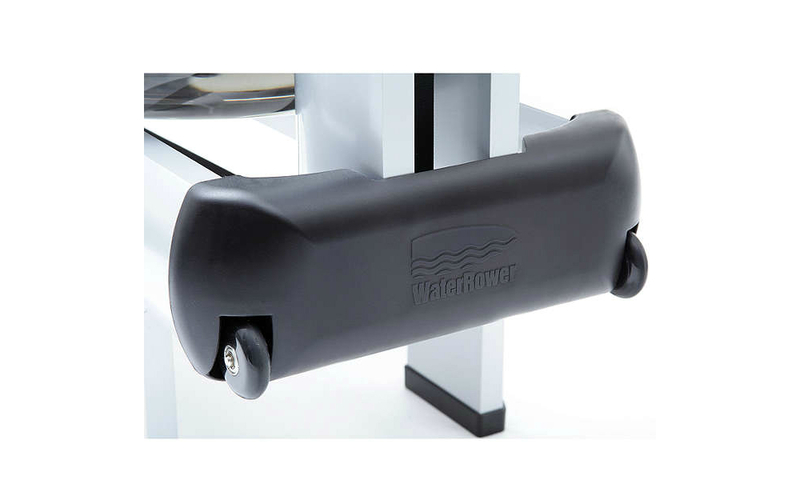 The WaterRower’s patented WaterFlywheel utilises the same physical elements (water) and the same physical dynamics (fluid drag) as occur when a boat moves through water. Bring the Art of Rowing to Dry Land with the WaterRower M1. The WaterRower M1 is a commercial model, the machine’s frame is constructed from fabricated tubular aluminium and a powder-coated in silver. It is also available in custom colours upon request. WaterRowers have been hugely popular ever since they entered the market back in 1988. They remain at the forefront when it comes to a realistic rowing experience. Using water as the resisting element, increase or decrease power with your own strength. Just like rowing on water, the faster you move, the higher the resistance. 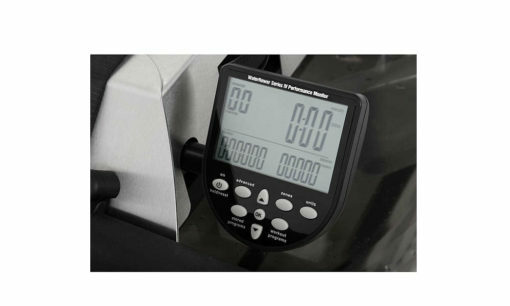 This has made WaterRower an incredibly popular product among professional athletes and first-time users alike. Though high in intensity, the exercise is gentle on the joints and is incredible for cardiovascular training. Enjoy the flawlessly smooth rolling motion created by the WaterRowers dual rail system, and comfort with their ergonomically designed seat. The M1 model also comes with a Series 4 Monitor which functions to display stroke rate, heart rate, total strokes, distance, duration, watts, and calories burned per hour. Weighing in at less than 60kg the machine is easily moved around on its guide wheel. 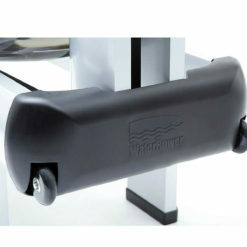 And when not in use, the WaterRower can be conveniently stored on end, taking up no more room than a dining room chair! HiRise: longer legs beneath the rower allow for an entry point 500mm/20″ making this model easier to access than the LoRise. LoRise: this has a height of 300mm/12″. Features a polycarbonate water tank making it virtually indestructible. We include FREE with this product: a lifetime supply of water purification tablets. A membership to online rowing community WeRow. A USB connection cable for downloading exercise data. A syphon pump for filling and changing water and a bottle of Danish Wood Oil, with an application cloth to keep your rower looking good as new! 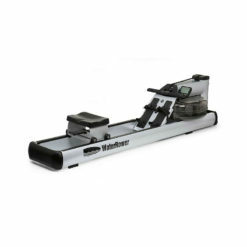 WaterRower have been making beautiful home rowing machines since the 1980's. 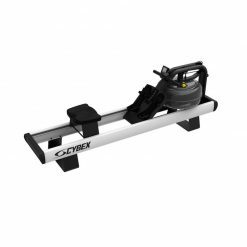 The first home rowers by Water Rower were made out of wood sourced from the Appalachian mountains in the USA, and the design of the water rowing machine is still more-or-less the same today, and is instantly recognisable in any home gym or commercial gym. 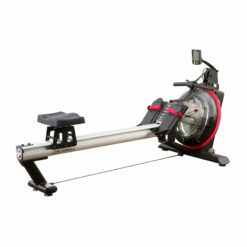 This machine is the preferred erg of British Rowing, who love the natural resistance provided by the patented flywheel inside a water tank. The harder you row, the greater the resistance. 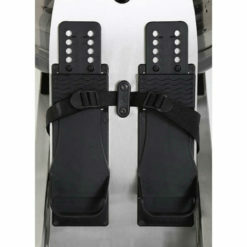 The home versions of the WaterRower are available in a number of different finishes, most of which stem from the use of different woods in the construction of the rowing machine. 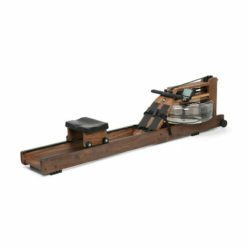 The Water Rower Classic is built in a beautiful Dark American Walnut, and us favoured by interior designers using darker colour schemes in home gym design projects. The Water Rower Natural is lighter in colour and made in stained honey oak. Equally, the Water Rower Oxbridge is lighter in its aesthetic, though the cherry wood finish is not quite as light as the Ash and is a little more orange in appearance. 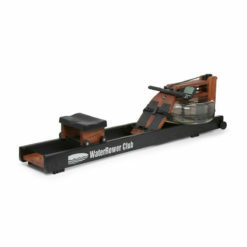 Lastly, the wooden Water Rower Club blends a modern stained black finish with rose stained ash, adding a different and eye catching element to any home gym. 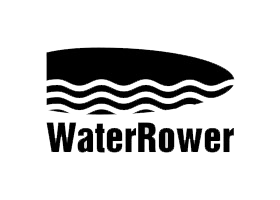 In recent years the team at WaterRower have been working to come up with new designer rowing machines that are made of different and interesting materials aside from wood. 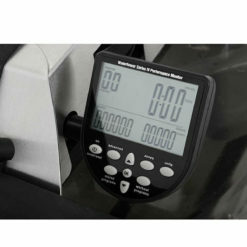 For example, one of our favourite luxury rowing machines is the stainless steel Water Rower S1. 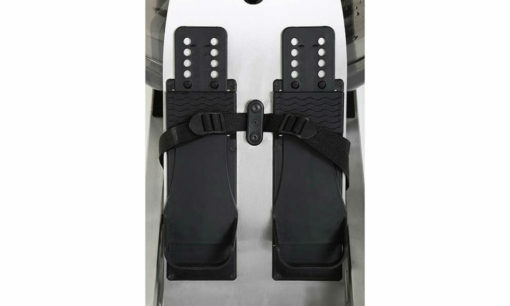 The company has also come up with a range of commercial rowing machines; and you won't find an erg more sturdy than the Water Rower M1 or the wooden Water Rower A1 Studio. Designed for serious professional and amateur rowers alike, this home rowing machine is both beautiful aesthetically and functionally competitive. Please do get in touch with our gym design team if you have any further questions or would like to purchase one for your home. We have a whole range of rowing machines and would love to take your call!